IT’S been a while. With all the events, restaurant openings and dinners out, time in the kitchen has been quite scarce. It came to the point where it was getting very frustrating. It’s been a while that I haven’t taken the time to cook, to enjoy the pleasure of mixing ingredients, and enjoy the whole culinary creative process. I claim to be a food blogger but how can I justify this statement if I don’t take the time to be in communion with the natural elements that compose a dish. Meat, fish, vegetables, dairies, spices, there is so much to learn and so much to investigate. Since having started my blog, I’ve also started to develop a lot of respect and, hopefully, a discerning taste for good ingredients. Fresh, in season, well cultivated or prepared; a great ingredient over a standard ingredient can be exactly the catalyst one needs to make that simple dish exceptional. Where before I would have had little qualms of buying my ingredients at the closest supermarket for a big meal, I now place a great deal of importance into how much better a meal can become when every component lives up to what my recipe deserves. Finding and choosing these perfect ingredients can be quite an laborious and time-consuming activity, though: all ingredients can be found in hundreds of varieties and varying qualities, all at different markets and stalls across the city. If you’re not sure where to find what you’re looking for, the process of finding your ingredients can easily take as long as the time you’ll spend in the kitchen. Wonderful world of the digital era… Being among those people who need human contact in order to feel at ease with the people I work and socialise with, I rarely order ingredients online…even though I have to admit that the range of choices for any ingredient for any type of cuisine is quite amazing…. Call me old-fashioned but there is nothing more rewarding than a smile or a simple ‘Hello’ in life and…. Just recently, I was given the opportunity to taste some meat from Donald Russell and experience their delivery process and customer service. I have to say that the whole process went extremely smoothly. The team really made an effort to present the meat as if you were receiving a gift. It wasn’t Christmas but it looked like it and it made the meat even more appealing. Some people would wonder about the reasons of being so enthusiast about a piece of meat. I understand that it may not be the most exciting thing in life but what we shouldn’t forget is the hard word that this piece of meat represents and all the people behind it. Of course, it is easy to go to the closest supermarket to buy meat for a meal. 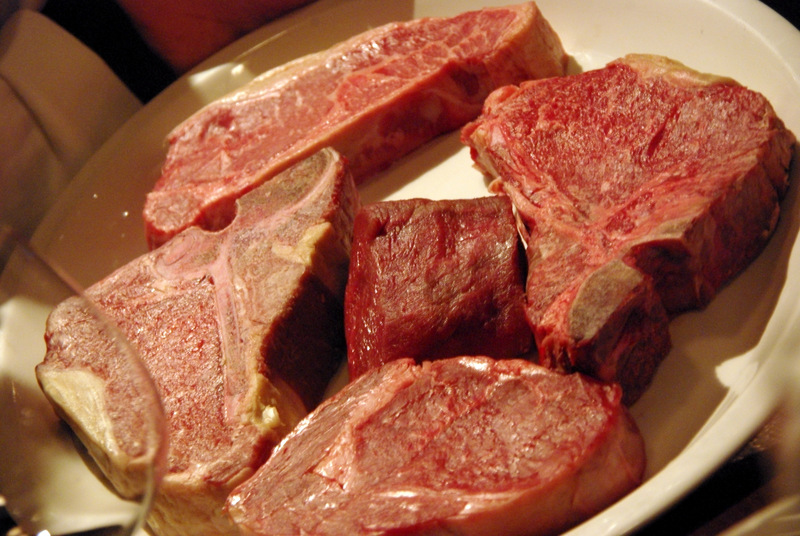 But to find tasty, tender and quality meat that have been prepared with care and love is another story. I discovered that the founder of Donald Russell, John Stone, co-wrote The Meat Buyers’ Guide, a classic text for butchers which established industry-wide standards for cutting, and helped earn him an MBE for services to the meat industry. You don’t joke with meat! When you meet liked-minded people so passionate about their meat, it’s like time has stopped and nothing else matters anymore. But it will always come the time when enjoying a good piece of meat will be more important than talking about it! Crush the sechuan peppercorns with the star anise add the five spice powder, then stir into the salt. Rub the pork on both sides with the salt mixture. 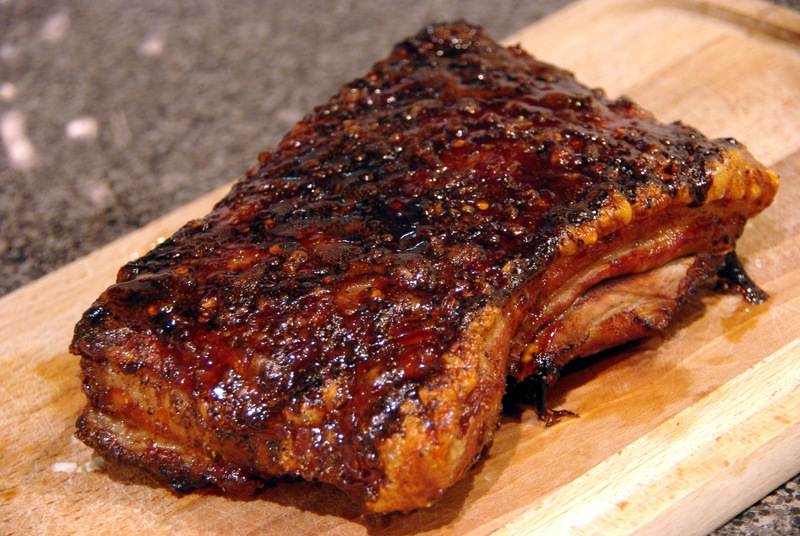 Pop the pork, skin up, in an oven dish that is just holds it. Leave overnight in the fridge. 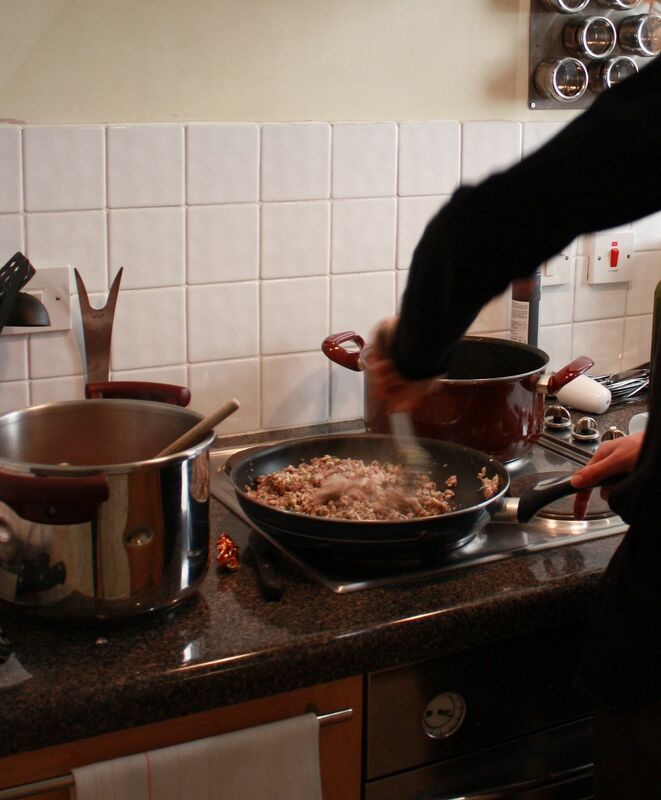 Remove the pork from the fridge and discard any liquid that has gathered. Heat your oven to 150C. Warm through the goose fat till it is pourable (not necessary if you are using the olive oil) cover the belly pork with the fat and cover the dish. Place in the oven and cook for 3 1/2 hours. When the Caramel is ready, whack up the heat and pour in the remaining ingredientsCook for about 4-5 until the sauce is thick. IN life, a project can start with a simple email or a phone call. From a simple suggestion to taste a chocolate pudding, who would have ever imagined that, a few weeks later, the tasting would have turned into the crazy idea of organising a review of brownies from different brands and bloggers willing to take part in the project. Beyond the tasting and reviewing (which is far from being the hardest task to accomplish, I must admit! ), I discovered people with a true love for brownies. A passion so intense that they can spend hours talking about these wonderfully intricate small squares of chocolate. Small, but so much to say! 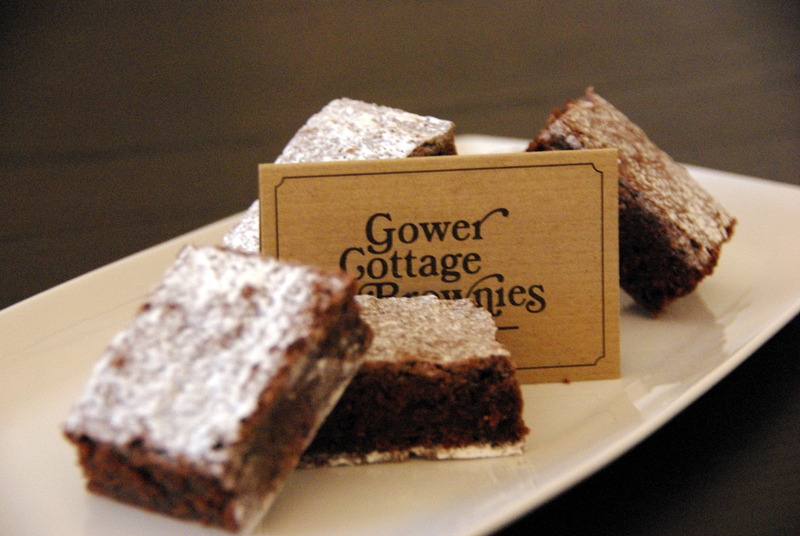 A brownie may cheer you up in the middle of the afternoon, an enjoyable moment of pleasure. Brownie makers, however, take the definition of a perfect brownie very seriously and spend hours creating the ultimate recipe. From the varying – and often contradictory – definitions they come up with, I’m sure they’d send just as much time arguing the said definition. 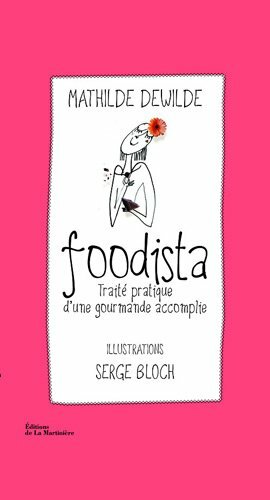 So, with pen, paper, water, a bottle of 2004 Domaine Pouderoux, Maury and 1988 Vin Santo Castelio di Verrazzano ready, Aforkfull, R_McCormack, Bridedwithfood, chocolatetour and my dearest D were ready to dig in and enlighten ourselves in the mystery of brownies. What started as a simple tasting, though, turned out to be a very instructive master class. What I thought was an insignificant piece of chocolate cake had actually much more to say in its defence than I could have imagined, especially with the incredible range we had at hand – Bea’s of Bloomsbury, Paul A Young, SoBo Chocolate, Leon, Gu, ChocStar, Paul’s cooking, Garlic Confit, Serious Treat, Gower Cottage, Sweet Things, Cocomaya, More Artisan, William Curley, Artisan du Chocolat, Cocoa Loco and Wholefoods. Learning #1: This ‘interesting beast somewhere between a cake, pudding, chocolate bar and a ….well cake again’, as Garlic Confit defines it, likes to differentiate itself. The most creative ones will play the fudgy and gooey game while the others will concentrate on the right balance between the crispiness and the chewiness. The brownie lives and likes to be eaten for itself and, among the 19 brownies tasted, none of them looked or tasted the same. 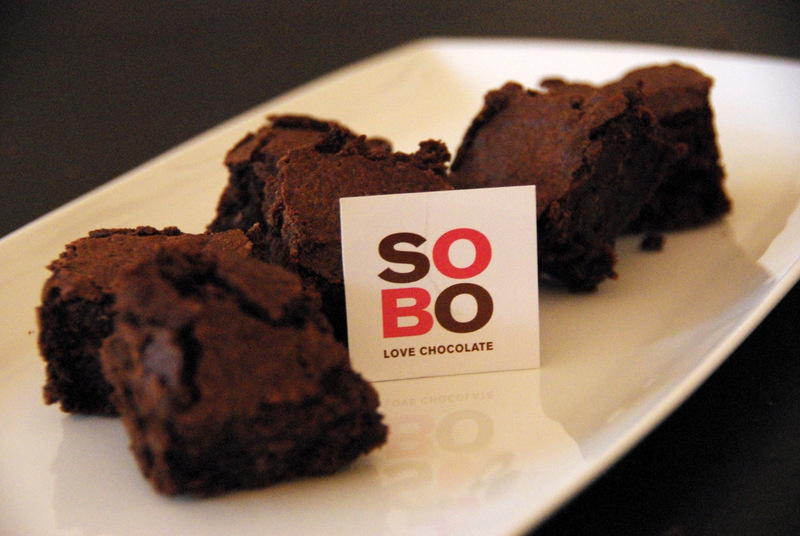 Team spirit is definitely not a notion that a brownie will fight for. Learning #2: Being creative is good…but not too much! Playing with flavours and texture adds a nice touch to the brownie world, it brings something different and unexpected but sometimes the classic remains the best. Learning #3: The choice of the ingredients and especially the quality of chocolate will make the success of the brownie. Use bad chocolate at your own risk! It usually results in a buttery, sugary cake that our poor palates have trouble enjoying for more than a bite. Learning #4: Judging isn’t an easy task. Expectations are high and you don’t want to disappoint anybody. Beyond that, each brownie was not made with the same audience in mind, nor were they made for the same purpose. Some are meant to bring us back to childhood, while others are epitome of chocolate perfection. But you have to make a choice and taking a decision – even if the fear of being blacklisted by everybody – suddenly crosses your mind (eek!). Learning #5: Water is your best friend! 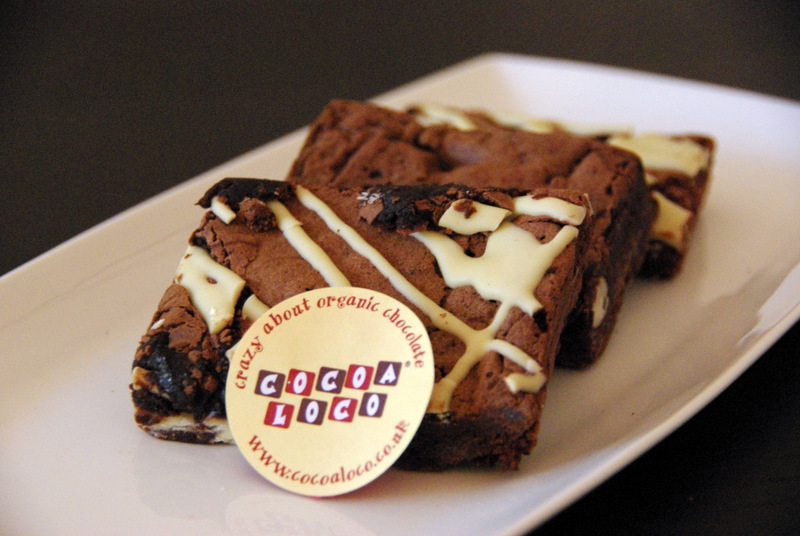 Drink a lot of water when you organise a brownie tasting… and stay away from chocolate for the next couple of days. After having enjoyed a few bites of each brownie, debating the taste and the texture, discussing the look, figuring out the quality of the chocolate and the necessity of adding flavours, rinsing your palates from sugar and duelling with the imminent stomach ache, it was time to compare notes and determine favourite choices. But how to feature it? A lot of questions came up to find a way to present our feedback. Should we give a prize to everybody? I don’t think so as the list was very long. Should I mention what we liked and what we disliked? I guess it could be a good learning. Should I list the brownie based on our rates? It wouldn’t be fair as some were made by professional chocolatiers and others by bloggers. We finally decided to announce our 5 favourites and explain our choice based on everybody’s feedback. 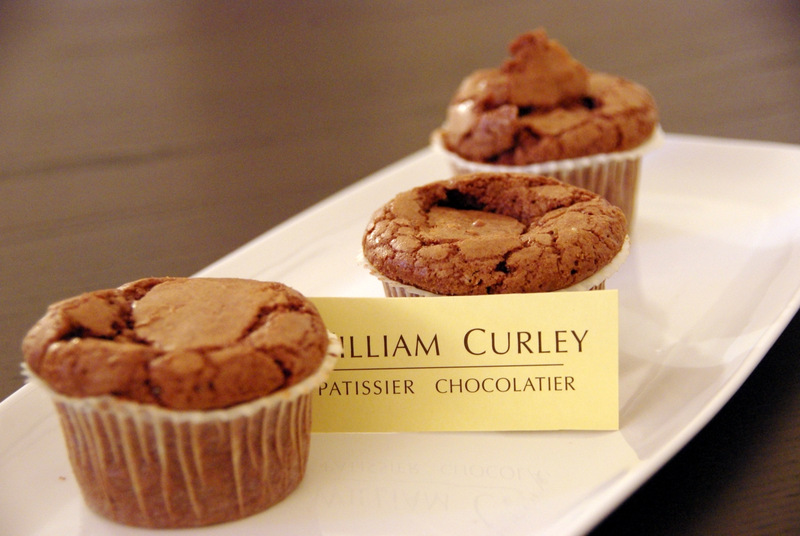 William Curley. A crunchy and gooey texture all at once with a light nutty taste obviously made with very good quality chocolate that created a perfect balance. 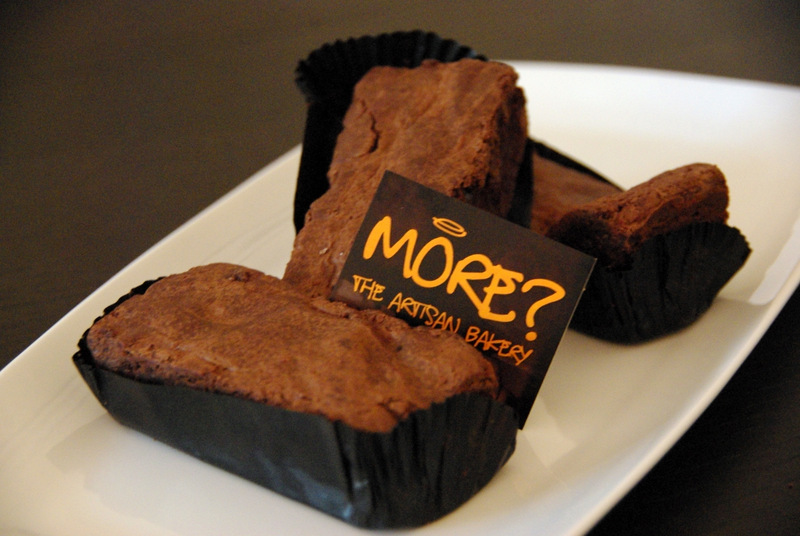 Funnily enough, the brownie looks more like a muffin but the taste is definitely what you expect from a brownie. Cocoa Loco. 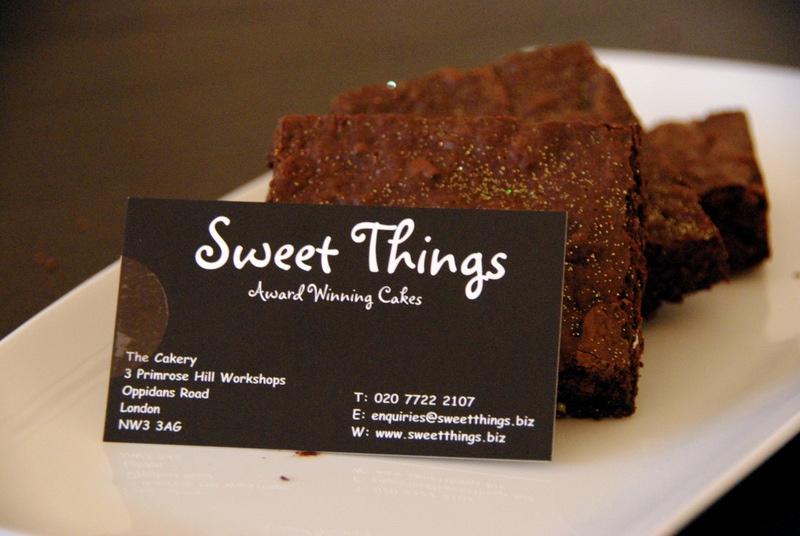 A denser brownie with a texture made of different layers that gives a nice crispiness in the mouth but still keeps its gooeyness. The chocolate is very tasty but not overpoweringly so with a light sugary taste. Sweet things. A nice full chocolate taste that stays in the mouth providing a comforting feeling. 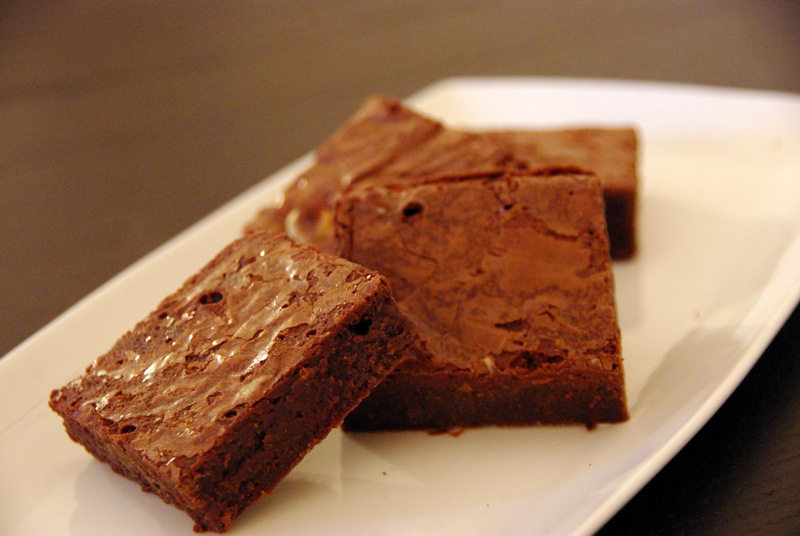 The brownie is nicely dense and fudgy without being too gooey. The glitter sparkles on the top adds a nice touch! ChocStar. The perfect texture, both crunchy at the top and fudgy inside. 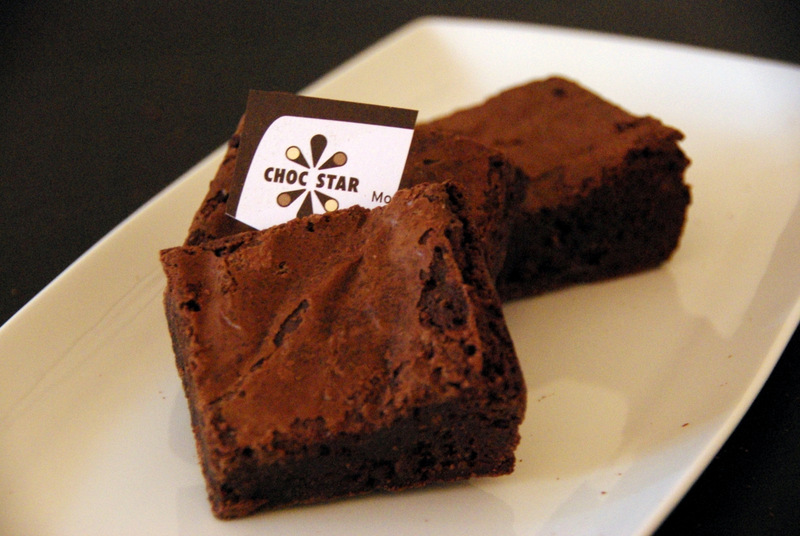 The brownie has a very nice smooth chocolate taste in mouth without being too sugary. Cocomaya. Despite being a bit heavy without any true crispiness, the texture feels very good. The chocolate is rich and intense with an interesting hint of sea salt. SoBo. 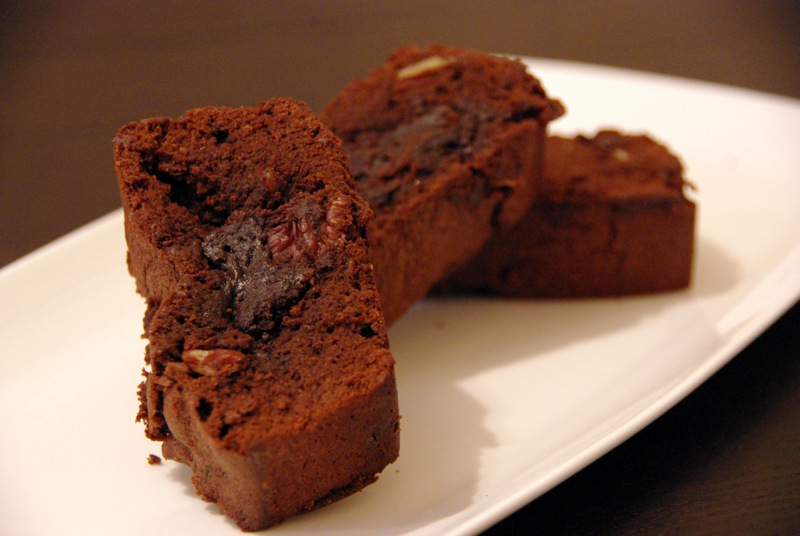 The Nut-lovers’ choice, the fudgy brownie started with a nutty taste which it held throughout. 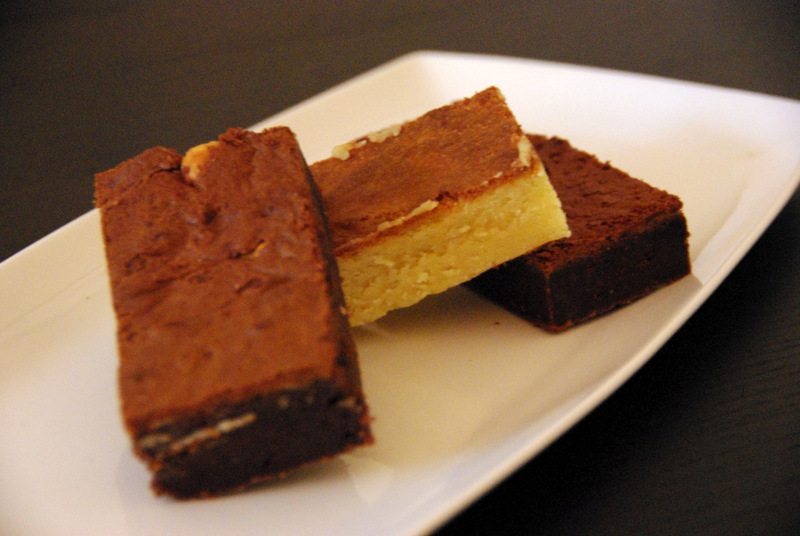 I would like to give a special mention to Bea’s of Bloomsbury white chocolate brownies. The texture reminds more of a flan but it has a very pleasant and smooth taste. For someone passionate about food, it was a unique opportunity to have the chance to taste all these brownies at once and I would like to thank all the chocolatiers as well as the bloggers Paul’s cooking & Garlic Confit who were willing to take part in this truly interesting and rich experience. Merci !